Getting The Health Benefits Of Green Tea Without Drinking It. You can get the health benefits of green tea by using it as a cooking liquid. Although I normally drink at least two cups of this healthy beverage every day, I also cook with it to get even more into my diet. It is a great way to boost the anti-oxidant levels in your food. I know the ingredient list seems quite lengthy, but this is a soup truly made from scratch. The ingredients all work very well together; the result is incredibly healthy and delicious. Rinse the shrimp shells in cool water. In a medium saucepan, combine the shells, filtered water, mace, peppercorns, cinnamon, cardamom, star anise, allspice, garlic, ginger and bay leaves. Bring to a boil, then reduce the heat and simmer for 20 minutes. Meanwhile, in a stockpot, heat the coconut oil over a medium flame. Add the carrots, onion and celery and cook until slightly browned (about 10 to 15 minutes.) Strain the shrimp shell and spice stock; add it to the vegetable mixture. Add the green tea, soy sauce, hoison sauce and cleaned shrimp. Cook until the shrimp is opaque, about 4 to 5 minutes. Top with chives. 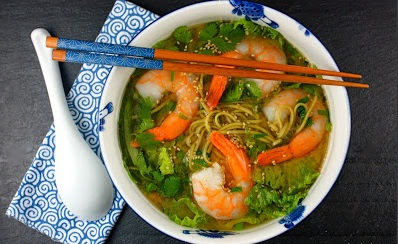 If you want a quick and easy version of this recipe, use a pre-made shrimp stock spiced with a store-bought spice blend. A Chinese Five Spice blend would suffice. The results would still be delicious, although not quite the same. Just keep the same ratio of 50/50 shrimp stock to green tea. Serve with Soba noodles for a heartier meal.